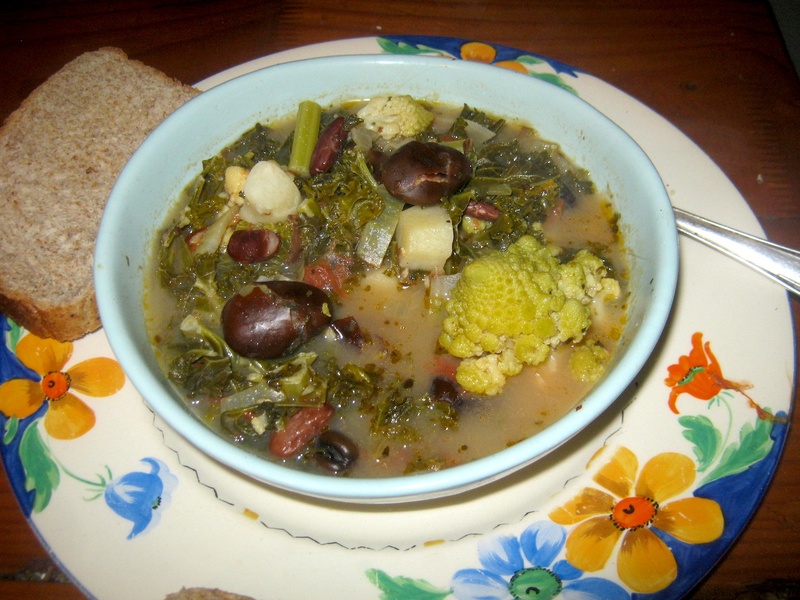 I love this herby kale and bean soup done the old fashioned slow way. As my husband is German, we often eat curly kale which is quite 'typical' in German rustic cuisine. We have it with sausage and mash, baked in an 'Auflauf' or casserole and other variations. For a change I wanted to try something lighter and ended up finding a lovely Italian soup recipe and making what is I suppose a minestrone, though it was not titled as one. Here garlic, herbs, olive oil and tomato set the key in which kale is enjoyed, and it also works well. Instead of using canned beans, which is quicker, I steamed the beans, and mixed a local Portuguese brand of fava beans, and a local Indian food supplier's Rajma beans. I see that fava and kale is also used in a Portuguese style soup. I believe sincerely in emptying our cupboards of ageing food. I dimly remember buying the fava beans about two years back. The older beans get, the tougher their skins and this necessitated a soak in weak bicarbonate. If you need to do this, don't make it too strong or they will taste soapy. Unfortunately bicarb destroys some of the bean amino acids, so it is better to use less ancient beans and soak for longer, than to use bicarb. The soup can be made vegetarian by simply excluding the meat bouillon and using vegetable bouillon or stock cubes. Without the meat broth the soup also contains zero cholesterol and lots of good lipids in the olive oil. I cook without salt and only sprinkle a very little fresh ground rock salt on when serving because of my health diet. Salt disrupts my blood-endothelium osmosis, and if you don't know what that is I hope you never have to find out. You can add as much salt as you wish for your taste at any stage if you are young or healthy and carefree. 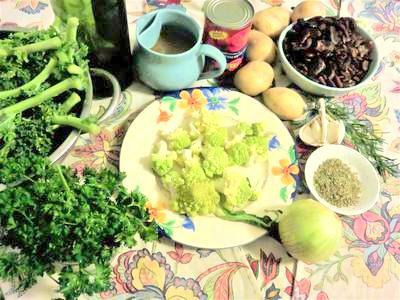 These ingredients made a huge pot of soup which could feed two for several days. We got about eight bowls of soup out of it. 3. Add boiling water and soak for at least 6 hours. 4. Make your meat bouillon in a pot and steam the fava beans in a perforated steamer above it to save electricity. 5. After half an hour add the smaller red Rajma beans. 6. Steam both until done. 12. Season to taste and serve "Kale and Bean Soup" with toast rubbed with raw garlic and drizzled with olive oil.